An heirloom First Communion Dress made from a family wedding gown connects generations in a very special way. Madeleine was beyond excited to have her dress specially designed and sewn just for her. Beyond her enthusiasm, it meant so much to me that it was lovingly made by my Mom from my wedding gown. Doris, my Mom, is our amazing seamstress at Once Upon a Time Creation. My veil was shortened and tailored for Madeleine. Even Betsy (her American Girl doll), received a custom-made matching dress. A wedding gown conversion is such a wonderful enhancement to an already happy, faithful occasion. This entry was posted in Custom Keepsakes and tagged First Communion Dress, First Communion matching doll dress, Wedding Gown conversion on February 27, 2013 by onceuponatimecreation. A little character in your powder room can be an unexpected surprise for guests visiting your home. 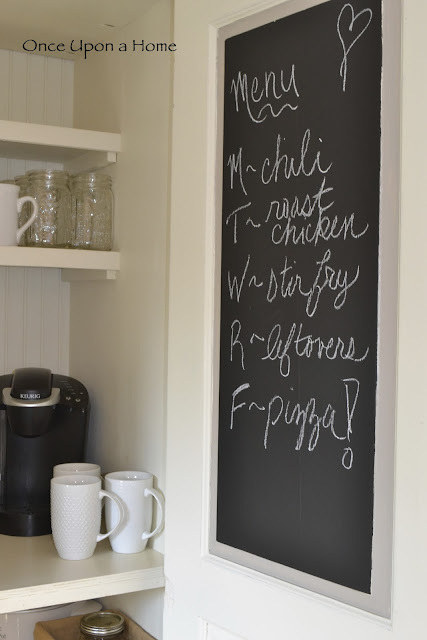 SInce this room is usually the smallest in the house, little details go a long way. The area for this sink is very small (about 16″ deep and 20″ wide). 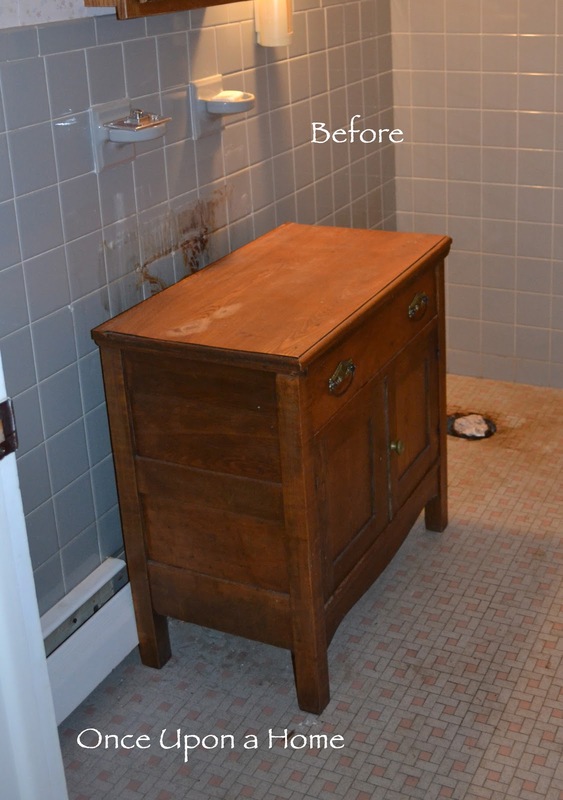 Painting the original cabinet and changing the sink top and faucet would have been a big improvement. But, since were changing the floor and everything had to come out anyway…might as well put in something fun. 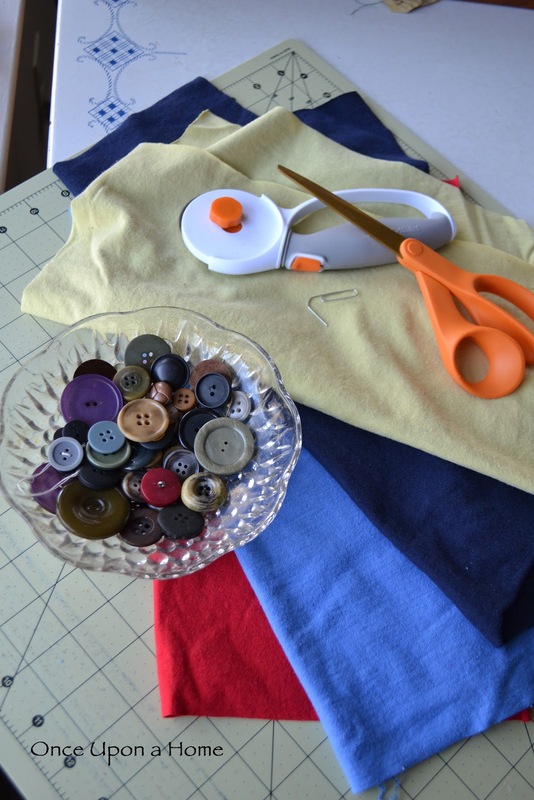 Metal sewing machine bases can be found a lot of places…thrift and consignment shops, garage sales, even on the curb on trash day. They are usually inexpensive (sometimes free) and are so versatile. They serve as great bases for sinks and tables of all sizes as they are well-built and sturdy. This sink is from Ikea and the plumber added the iron “rails” on the front and back for the sink to sit on. The faucet looks like an old pump. To find one, just google “faucet open spout” . There are lots to choose from. When we took the original cabinet out, the wall next to the sink was a mess. We added the bead board wainscoting and love it. Barn wood floors, wider moulding, and a bit more bead board round out the vintage feel. This entry was posted in Bathroom Bliss and tagged powder room, sewing machine sink, small sink on February 24, 2013 by onceuponatimecreation. Do we have to use EVERY glass in the house by the end of the day??? I only have two kids, and they would go through about 12 glasses a day. They would take one out, fill it, drink half, leave it on the counter, and forget which one was which. God forbid they drink out of the other one’s glass, so next time they were thirsty…just grab another glass. These markers are free and so easy. Cut an old t-shirt into quarter inch strips (I used a rotary cutter, but scissors work just as well). Thread the strips through the button holes. If you need help, use a paper clip. Put it around the glass, pull as tightly as you can, tie in a knot, and cut off the extra. For the ones above, I used two buttons on each to make them a little more interesting. We use Ball jars for everything…dry storage, leftovers, and drinking glasses. These are wide mouth pint size jars. At about $10-$15 a case, Ball jars are very inexpensive, easily replaced, much sturdier than most glasses, and just fun. If you don’t have a button collection, try starting one. You can usually find containers of them at yard sales and thrift stores. They are great for little home projects and crafts for the kids. This entry was posted in In the Kitchen, Mason Jars and tagged buttons, mason jars, old t-shirts on February 18, 2013 by onceuponatimecreation. Inspiration can be found anywhere, sometimes in the most unlikely places. I owe this week’s inspiration to a good friend. C has many passions, but, by her own admission, decorating is not one of them. Even so, over the past couple weeks, she made simple changes that had a big impact. She cleared a bit of clutter and added colorful pottery to a couple shelves, added new throw pillows, and replaced a “well-loved” ottoman. The room looks fantastic. My friend reminded me that the feel of a room is in the details. 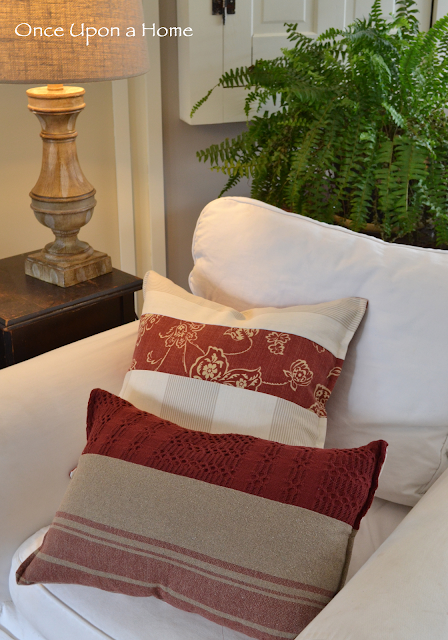 Changing throw pillows is a fast, inexpensive and very effective way to add a new color, change decor with the seasons, or just have a little decorating fun. Now inspired, I set off to create a couple pillows. 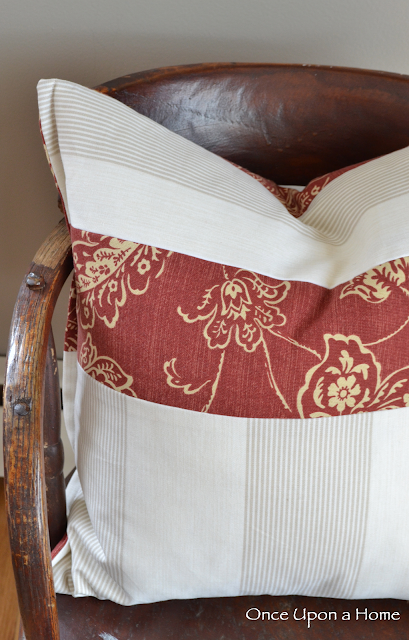 These red fabric scraps were plucked from a plastic storage bin and put to work. There weren’t any pieces large enough to cover a whole pillow, so they ended up as a bit of patchwork. Love how they turned out…even got a compliment from my better half. Well, he asked, “Can we keep those?” That’s a compliment, right??? Also found these fun blue scraps and vintage tea towel…more pillows to come. This entry was posted in Throw Pillow Fun and tagged accent color, patchwork pillow, throw pillow on February 8, 2013 by onceuponatimecreation. You never know where you might strike gold….found this piece of furniture in my friend Mary’s garage. Her only stipulation was that I could not bring it back. Sold! You should have seen the original sink…a not very exciting oak stock cabinet that was put in quite a number of years ago. The sink was small, but I did not want to pay for a double sink plumbing upgrade. Found this amazing wide sink at Ikea for a great price. Both kids can brush their teeth without hurting each other (most of the time). 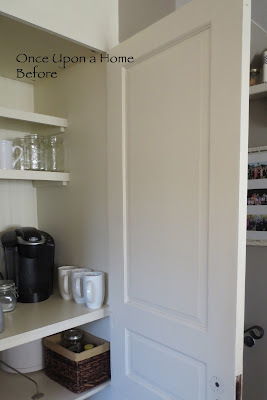 The cabinet was sanded, painted an antique white and sealed with a water based polyurethane (so it won’t yellow). The glass knobs and handles are from Target. We obviously have a very understanding plumber who is never surprised by the projects I throw at him. He did a great job installing everything. A sugar and creamer pair found a home in the old cup and toothbrush holders that are permanently tiled to the wall. They keep our cotton balls and q-tips handy. 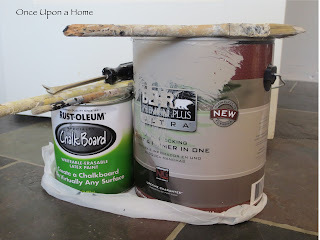 Will fill you in on the rest of this bathroom redo later….enjoy your day! 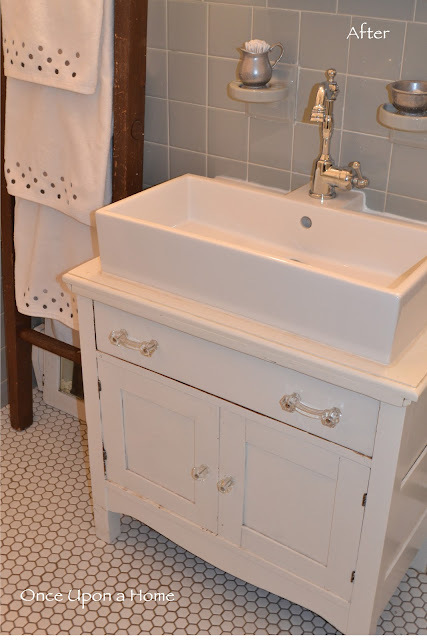 This entry was posted in Bathroom Bliss and tagged bathroom sink, furniture sink, vintage bathroom on February 6, 2013 by onceuponatimecreation.